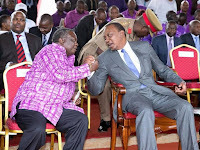 Wednesday September 12, 2018-Central Organisation of Trade Union (COTU) Secretary General, Francis Atwoli, has urged the Government to scrap the 16% VAT on petroleum products because it is making life unbearable for Kenyans. Addressing a press conference on Wednesday, Atwoli asked President Uhuru Kenyatta to intervene and have the fuel levy removed. He also wondered why President Uhuru Kenyatta has been silent yet millions of Kenyans are suffering due to high fuel prices. “Since the President returned from China, the public has been waiting from him to comment on the issue," he said. Atwoli also asked the Head of State to tax the rich who are known to be wheel dealers and tenderpreneurs and protect the poor. “We need to look for other means of getting revenue," Atwoli said. Since his return from China on Monday, Uhuru is yet to speak about introduction of 16 percent VAT on petroleum products.